Universities are enormous organizations comprised of many moving parts. They’ve got different departments, programs, initiatives, colleges or schools, student organizations and clubs, etc. It’s a logistical headache just to think about all of the events going on at a University in a given month. Even those of us who went to a smaller University can understand how hard it is to keep track of what is happening and when. Is that choral concert this Friday or next? When is that Religion Department debate? Isn’t their a visiting artist at the gallery sometime this month? It can become a pain when each department or initiative within a University is using a different method to announce and promote their events. Enter Events Calendar PRO. With Events Calendar PRO you can share, from one central location, ALL of the events going on at your University in a simple, clean, and effective way. With our brand new Filter Bar add-on you can make the end-user experience even more enjoyable by providing simple filtering options. Imagine the scenario mentioned earlier with the choral concert, debate and art gallery. Instead of going to the home page for each of these departments, a person could instead go to the campus-wide calendar, quickly filter the results they want, and in a matter of seconds know exactly when and where they need to be. With Events Calendar PRO each department and organization will be able to share and promote their events in a unified experience for the end user. This is a win for both parties. 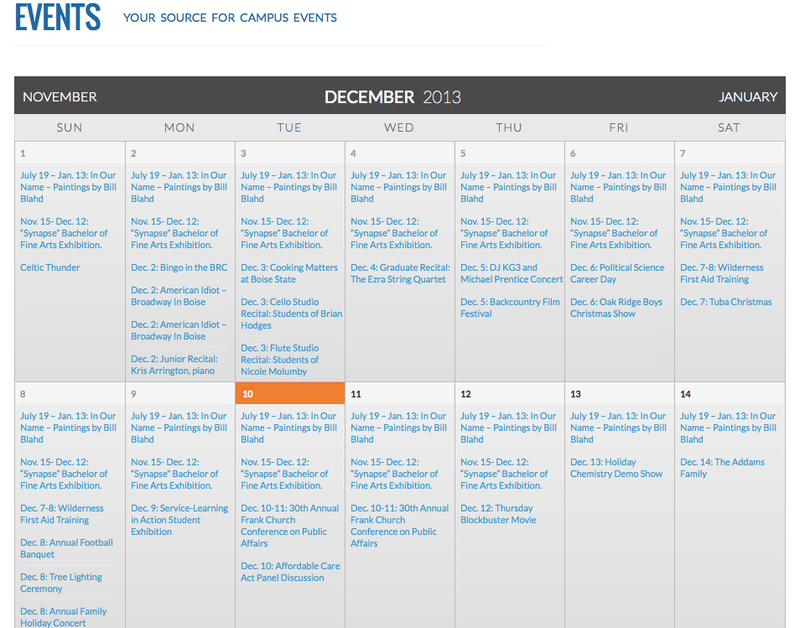 Boise State University Uses Events Calendar PRO. 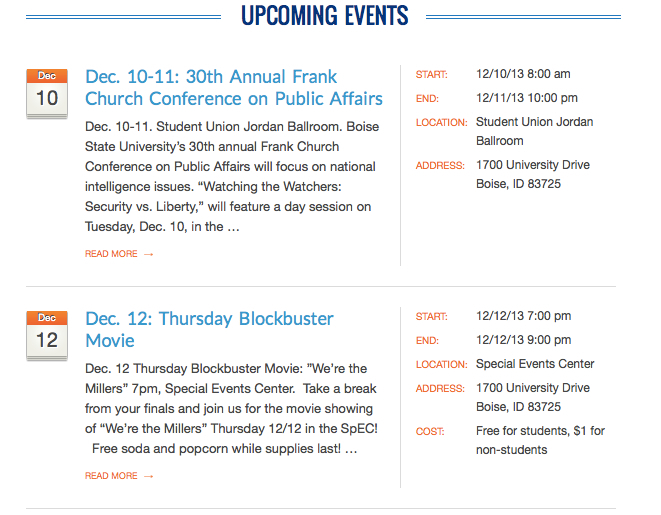 Boise State has all of their events, seen here in list view and month view, displayed in a legible, easy to navigate way. All the details needed are quickly found and each event can be imported to the user’s iCal or Google Calendar. What a simple solution to an all too common problem! But the solutions don’t stop here. Let’s tackle ticket sales while we’re at it. Having all of your University’s events on one great calendar is a huge win. But what if you could combine the ticketing process with that same calendar? Then you’d have a fantastic way to provide even more value to your community while simultaneously making less work for your staff. The Fine Arts department at your university could add performances for it’s Choir, Jazz Band, Orchestra, Concert Band, Musical, Play, and Senior Showcases to the calendar. Then, using one of our ticketing add-ons, the Fine Arts department could provide the ability to purchase tickets to those events straight from their listing on the calendar! In one place an interested individual would be able to find all of the upcoming performances of the Fine Arts Department and purchase tickets to the events of their choice. No third parties, no need for multiple sites or tricky navigation, just one place to go. So simple! Extrapolate that ability across all the departments, clubs, and organizations at your University and you can see how Events Calendar PRO can make the logistics of a University-wide calendar and the subsequent ticket sales much less daunting. Hypothetically speaking this sounds great, right? But what is required to get Events Calendar PRO working like the example above? Luckily, not too much. Setting up Events Calendar PRO is simple and your University’s website folks will be able to handle it without much effort. Your website has to be built on WordPress. WordPress is uniquely positioned to provide exceptional solutions for managing university websites. We’re seeing a growing demand, as universities switch from proprietary content management solutions, to flexible, easy to use, open source WordPress based solutions. If your University is not using WordPress for it’s site, now might be a great time to consider switching over. Knowing the internal politics of academic institutions, that’s likely easier said than done. That doesn’t mean that ECP and WordPress can’t be a tool that your university can use. Launching a simple WordPress & Events Calendar PRO site to solely manage events can be done in an afternoon. We put together a demo site at WPShindig to show how you can do the same. This method isn’t ideal, but it certainly beats not using Events Calendar PRO at all. Obviously, the best setup would be to have the University’s entire site on WordPress. You will need to purchase a license for Events Calendar PRO. Most likely you’ll only need the ‘Personal’ license, which costs just $65! Not bad at all. Should you desire to sell tickets through Events Calendar PRO you’ll also have to pick up a license for one of our many ticket add-ons. The ‘Personal’ license for one of these add-ons is $65 as well. Put Your Events On The Calendar! Once you’ve purchased and installed the plugins, you’re ready to start adding events to the calendar. Obviously, you’ll have to decide how you want to handle the gathering of information and posting of events; one master admin or multiple people with event posting privileges. While data entry will be the most time consuming portion of the setup, it is well worth it in the end. You’ll have a beautiful calendar, full of events from all across your campus, in a centralized, easy to navigate calendar for your whole community. Now that you’ve done the work to make your campus calendar awesome, you’ll want everyone to know right? So be sure to tell your community where they can find all the information on upcoming events. The really cool part is that Events Calendar PRO is so intuitive to use that you won’t have to post a tutorial video or a step-by-step guide. Just share the link and your community will know exactly how to find the events they are looking for. If you want to simplify your University calendar and make it easier for the end-user to find the information they need, Events Calendar PRO is the answer. Head over to the Events Calendar PRO page for screenshots and more detailed information. Also, don’t forget to check out WP Shindig for a live demo of Events Calendar PRO. 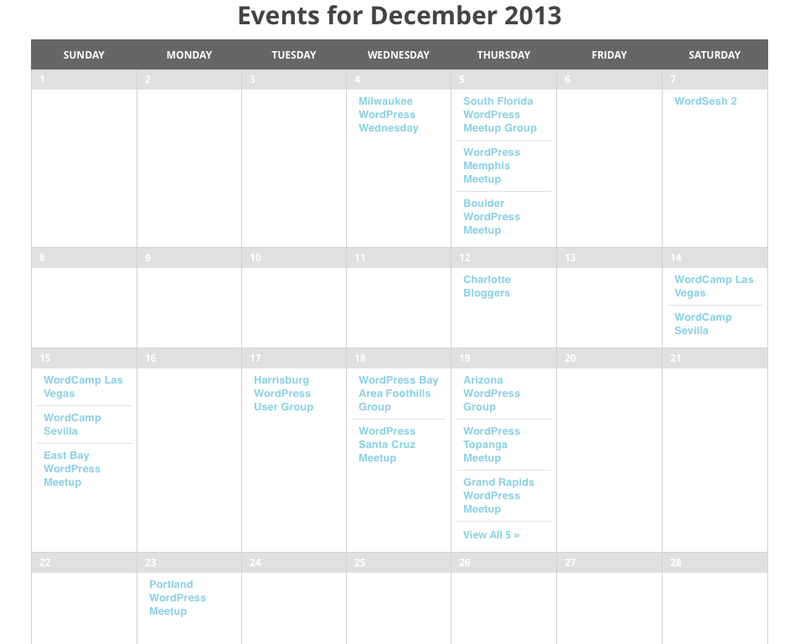 WP Shindig is a live demo site for Events Calendar PRO. If you have specific questions about implementation don’t hesitate to email pro[at]tri.be, we’d love to talk with you about how Events Calendar PRO can help take the headache out of events at your University!